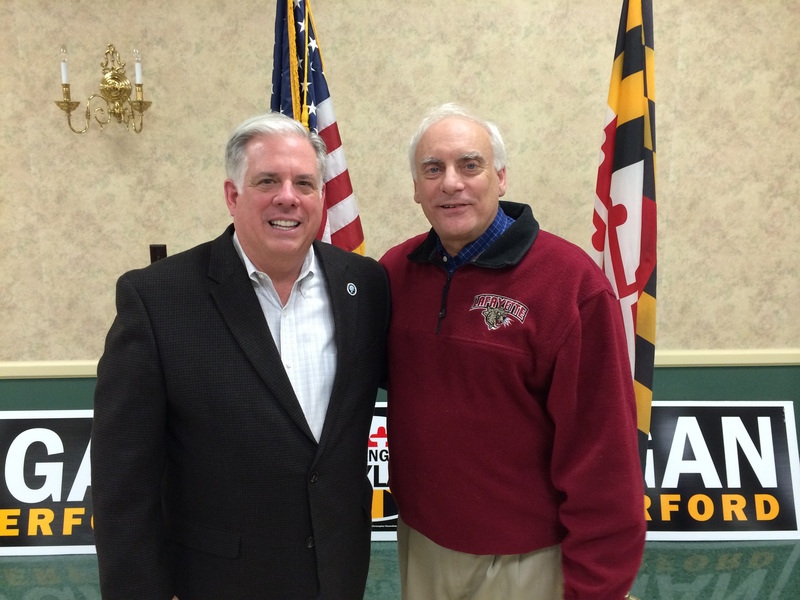 If I had not read in the news that Governor Hogan was going to be in town for the big parade Saturday evening, I certainly would have known it from Facebook. Suddenly there were dozens of pictures from a variety of people who shared that they were with the governor and had a picture taken with him. Hey, I get it, I really do. He’s a really good guy, and I’ve done the same thing. Maybe I’ll share my own picture of Larry and me at the end, if I remember it by then. There is something about liking to be seen with important people. It is probably because just being with them makes us feel better about ourselves. Or worse, maybe we hope they’ll do something for us if they like us. And on the other hand, there is something natural in all of us about backing away from people who are by outward appearance very disheveled and dirty in some way resultant from lifestyle or circumstance. And just as we hope the good stuff of the rich and famous may rub off on us, we fear the bad stuff of the poor and outcast might do the same. James is writing to a Jewish audience that surely had a lot of background in people categorization. (Wasn’t that a nice way of saying “judgmentalism?”) Some of this was legitimate in terms of Old Testament obligations relative to the approach to God. But the gospel message breaks that all down, with words like “Come unto me, all ye that labor and are heavy laden…” (Sorry, went KJV on you there … youthful Scripture memory coming out!). These early Christians were showing some favoritism with people who came into their meetings. I realize it doesn’t necessarily sound like it from the first verse … James 2:1 – My brothers and sisters, believers in our glorious Lord Jesus Christ must not show favoritism. Actually, this was more than a general warning or admonition. The way it is written in Greek (complicated to explain) indicates that this was something already going on. James 2:2 – Suppose a man comes into your meeting wearing a gold ring and fine clothes, and a poor man in filthy old clothes also comes in. 3 If you show special attention to the man wearing fine clothes and say, “Here’s a good seat for you,” but say to the poor man, “You stand there” or “Sit on the floor by my feet,” 4 have you not discriminated among yourselves and become judges with evil thoughts? The church is the ultimate place for inclusion – not in terms of overlooking sin, but rather by welcoming all peoples to enter into and successfully sustain a walk with God. When we rightly understand theology and the common denominator we all have as sinners from before birth, there is no high ground from which to cast judgments on others. James 2:5 – Listen, my dear brothers and sisters: Has not God chosen those who are poor in the eyes of the world to be rich in faith and to inherit the kingdom he promised those who love him? 6 But you have dishonored the poor. Is it not the rich who are exploiting you? Are they not the ones who are dragging you into court? 7 Are they not the ones who are blaspheming the noble name of him to whom you belong? It is a fact that those who are rich find it more difficult to trust in something beyond their own powers and security, as their wealth stands in the way. So those who are chosen end up to more often be those who admit their need. So why should James’ readers dishonor the poor? Beyond that, the social problems being experienced by these earliest Christians – accusatory legal problems and slander against them and the name of Christ – are not coming from the poor, but rather more from the wealthy by worldly standards. James 2:8 – If you really keep the royal law found in Scripture, “Love your neighbor as yourself,” you are doing right. 9 But if you show favoritism, you sin and are convicted by the law as lawbreakers. 10 For whoever keeps the whole law and yet stumbles at just one point is guilty of breaking all of it. 11 For he who said, “You shall not commit adultery,” also said, “You shall not murder.” If you do not commit adultery but do commit murder, you have become a lawbreaker. So what is the big deal about showing some favoritism? It’s not like murder or adultery. But James argues for the unity of God’s law, citing that the #1 governing principle for all human relationships is to love one’s neighbor as one’s self. And if that is violated by favoritism, it breaks the whole law. It therefore is no trifling matter, it is a big deal. James 2:12 – Speak and act as those who are going to be judged by the law that gives freedom, 13 because judgment without mercy will be shown to anyone who has not been merciful. Mercy triumphs over judgment. A day of judgment comes for all people who are believers (2 Cor. 5:10). One who has shown mercy to others can expect mercy at this time, for that is greater than judgment. There will be a lack of mercy for those who have likewise failed to demonstrate mercy, grace and love for others. Having received so much grace, Christians, of all people, should be the first to display love and mercy to others. This is being Christlike. The favoritism that is correct is to show it toward all people, looking away from self, especially to those who most need it and who may be most open to it. Are we a church who functions this way? Are we in any way like the recipients of James’ letter? We can say that we don’t have special seating arrangements that actively preclude anyone from being a part of our gatherings. But could we be passively exclusionary? We could be if we are unwilling to warmly welcome and embrace new people, especially if they are different in some form or fashion from the mainline, majority group of our church. At this moment of our history we especially need people who will show favoritism toward all strangers, rather than merely being comfortable with our well-known crowd of friends. God is already sending us an increasingly diverse group of first-time attenders. This is only going to increase, especially if some of our intentional outreach efforts and new partnerships begin to bear fruit. This entry was posted in For Our City and tagged James 2:1-13 by Randy Buchman. Bookmark the permalink.